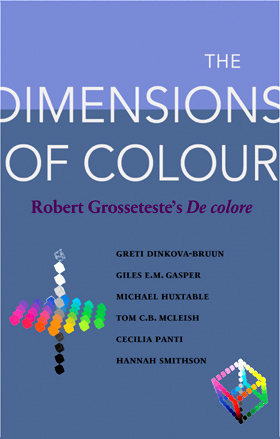 stand sold out of copies of the Dimensions of Colour. You can order copies from PIMS or University of Toronto Press directly if you’re in North America. If you are elsewhere please contact the Institute of Medieval and Early Modern Studies in Durham and we will supply copies(the administrator’s address is on the contact details). The Dimensions of Colour will be being ‘baptised’ at the IMEMS publication series book launch, this Friday, 24th May, in Durham. This will be the first of the Grosseteste Science Library, the De luce will follow next year, and then the De iride.